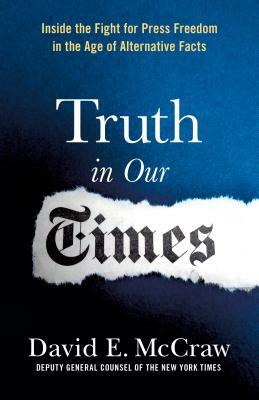 Truth in Our Times By David McCraw is an incredible read on the value of appreciating quality writing and research in a time when false information repeated over and over again takes on the element of reality. as a democracy we are now confronted with the decision to support a free press where quality research is critical or to turn over the distribution of information to pundits A book for the times. In October 2016, when Donald Trump's lawyer demanded that The New York Times retract an article focused on two women that accused Trump of touching them inappropriately, David McCraw's scathing letter of refusal went viral and he became a hero of press freedom everywhere. But as you'll see in Truth in Our Times, for the top newsroom lawyer at the paper of record, it was just another day at the office. McCraw has worked at the Times since 2002, leading the paper's fight for freedom of information, defending it against libel suits, and providing legal counsel to the reporters breaking the biggest stories of the year. In short: if you've read a controversial story in the paper since the Bush administration, it went across his desk first. From Chelsea Manning's leaks to Trump's tax returns, McCraw is at the center of the paper's decisions about what news is fit to print. In Truth in Our Times, McCraw recounts the hard legal decisions behind the most impactful stories of the last decade with candor and style. The book is simultaneously a rare peek behind the curtain of the celebrated organization, a love letter to freedom of the press, and a decisive rebuttal of Trump's fake news slur through a series of hard cases. It is an absolute must-have for any dedicated reader of The New York Times. DAVID MCCRAW is Deputy General Counsel at The New York Times, where he has worked since 2002. He provides legal counsel to the newsroom regarding libel, freedom of information, court access, litigation and news-gathering. Previously, he was Deputy General Counsel of The New York Daily News. He conducts workshops and performs pro bono work for freedom of press and information around the world. He is an adjunct professor at the NYU School of Law and a visiting lecturer at Harvard Law School.